This item includes 1 individual replacement cell and is designed for use with the Supra alternating pressure mattress system. The cell can replace an existing damaged cell or can be used as an emergency back up. 8" cell depth can support up to 350 lbs. 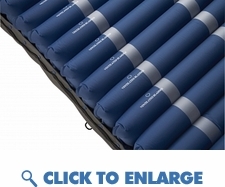 Replacement cell inner-changeable with any 8" alternating pressure mattress with cell in cell design.